To realize high efficiency, great manageability and energy saving in industrial induction motor related applications, it is necessary to adopt controllable frequency converter systems. Frequency converter system nowadays is AC motor fed by a static frequency converter. The up-to-date frequency converter works great for AC motor applications and easy installation. One important issue, however, is caused by the non-sinusoidal output voltage. This factor has caused a lot of undesirable problems. Increased induction motor losses, noise and vibrations, detrimental impact on the induction insulation system, and bearing failure are examples of frequency converter related systems' issues. Increased induction losses mean a de-rating of the induction output power to prevent overheating. Measurement in the lab shows that temperature rises may be 40% higher with frequency converter compared with general power supplies. Continuous research and enhancement of frequency converters have solved many of these issues. Unfortunately, it seems that solving one problem has accented another. Reducing the induction and frequency converter losses tends to increase the detrimental impact on the insulation. The induction manufacturers are, of course, aware of this. New induction designs (inverter-resistant motors) are beginning to appear on the market. Better stator winding insulation and other structural improvements ensure induction motors that will be better adapted for frequency converter applications. One of the most serious problems to the induction motor has been the difficulty of adapting it to speed adjusting. The synchronous speed of an AC motor is determined by the following equation. The only way to adjust the speed, for a given pole number is to change the frequency. The AC power source is rectified into a DC voltage. The DC voltage is chopped up into an AC voltage of the desired frequency. A frequency converter basically consists of three blocks: the rectifier, the DC-link, and the inverter. The PWM (Pulse Width Modulation) is widely applied in the frequency converter industry. They are available from a several hundred watts up to megawatts. 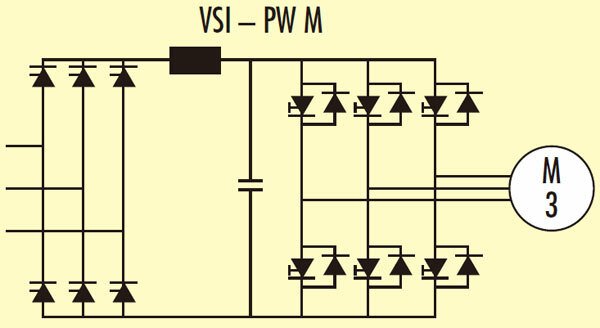 A PWM converter does not have to match the load exactly, it need only make sure that the load does not consume current higher than the PWM converter is rated for. It is quite possible to run a 20 kW induction with a 100 kW PWM converter. This is a great benefit that makes operation easier for the application. 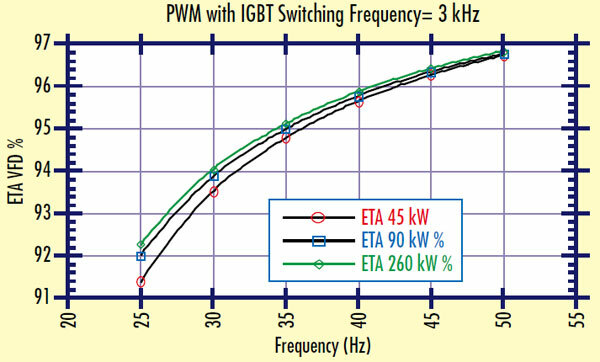 Nowadays, the PWM frequency converter is using Insulated Gate Bipolar Translator (IGBT). Modern PWM frequency converters perform very well, and are not far behind designs using a sinusoidal power supply - at least not in the power range up to 100 kW or so. The current source inverter is a rough and rather simple design compared with the PWM. It uses simple thyristors or SCRs in the power circuits, which makes it much cheaper. It has also benefit of being very reliable. The design makes it short-circuit proof because of the large inductors in the DC link. It is bulkier than the PWM. Earlier, the current source inverter was the best choice for big loads. A disadvantage with the current source inverter is the need of matching to the load. The frequency converter has to be designed for the induction motor used. In fact, the induction itself is a part of the inverted circuit. The current source inverter supplies the induction motor with a square-shaped current. At low speeds, the induction produces a cogging torque. This type of frequency converter will generate more noise on the supply source compared to the PWM converter. Filtering is necessary. Heavy voltage transients in the output voltage are an additional disadvantage of the current source inverter. The transients can reach nearly twice the nominal voltage in the worst cases. There is also a risk that the winding insulation will be worn out prematurely, if this frequency converter is used. This effect is most serious when the load does not match the frequency converter properly. This can happen when running at part load. This kind of frequency converter is losing its popularity more and more. A flux vector control is a more sophisticated type of frequency converter that is used in applications having extreme control demands. In paper mills for example, it is necessary to control speed and stretching forces very precisely. A FVC frequency converter always has some kind of feedback loop. This kind of frequency converter is generally of minor interest in pump applications. It is expensive, and its benefits cannot be taken advantage of. An induction works best when supplied with a pure sinusoidal-voltage source. This is mostly the case when connected to a robust utility power source. When an induction is connected to a frequency converter, it will be supplied with a non-sinusoidal voltage—more like a chopped square voltage. If we supply a 3-phase induction with a symmetrical 3-phase square voltage, all the harmonics that are multiples of three, as well as the even numbers, will be eliminated because of symmetry. But, still left are the numbers 5;7 and 11;13 and 17;19 and 23;25 and so on. For each pair of harmonics, the lower number is reverse rotating and the higher number is forward rotating. The speed of the induction motor is determined by the fundamental number, or number 1, because of its strong dominance. Now what happens to the harmonics? From the point of view of harmonics, the induction seems to have the rotor blocked, which means that the slip is approximately 1 for the harmonics. These provide no useful work. The result is mostly rotor losses and extra heating. In our application in particular, this is a serious outcome. With modern technology, however, it is possible to eliminate much of the harmonic content in the induction current, thereby reducing the extra losses. The earliest frequency converters often used a simple square voltage to supply the induction motor. They caused heating-up problems and the inductions ran with a typical noise caused by torque ripple. Much better performance was achieved by simply eliminating the fifth and the seventh. That was done through some extra switching of the voltage signal. Nowadays, the technique is more sophisticated and most of the disadvantages are history. Development of fast power semiconductors and the micro-processor has made it possible to tailor the switching pattern in such a way that most of the harmful harmonics are eliminated. Switching frequencies up to 20 kHz are available for frequency converters in the medium-power range (up to some tens of kW). The induction current with this type of frequency converter will be nearly sinus shaped. At a high switching frequency, induction losses are kept low, but losses in the frequency converter will increase. The total losses will become higher at excessively high switching frequencies. To obtain the best performance at various speeds, it becomes necessary to maintain an appropriate magnetization level for the induction for each speed. 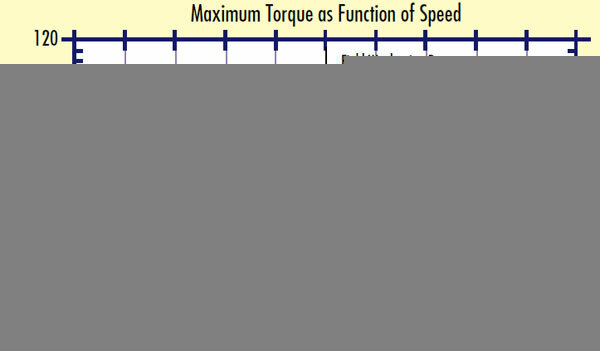 A range of various torque characteristics is shown as following figure. For the constant torque load, the V/F ratio must be constant. For the square torque load, a constant V/F ratio will result in excessively high magnetization at lower speed. This will generate unnecessarily high iron losses and resistance losses (I2R). It is better to use a square V/F ratio. The iron losses and I2R losses are thus reduced to a level more acceptable for the actual load torque. If we look at the Figure, we find that the voltage has reached its maximum and cannot be increased above the 50Hz base frequency. 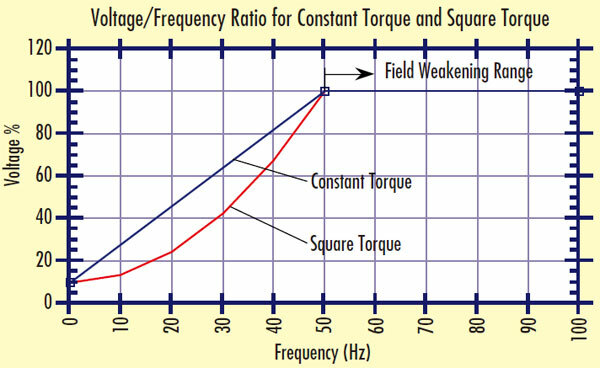 The range above the base frequency is called the field weakening range. A consequence of this is that it is no longer possible to maintain the necessary torque without increasing the current. This will result in heating-up problems of the same kind as with normal under voltages run from a sinusoidal power grid. The frequency converter’s rated current will likely be exceeded. Sometimes, there is a temptation to run the pump at frequencies above the commercial power grid frequency in order to reach a duty point that would otherwise be impossible. Doing so calls for extra awareness. The shaft power for a pump will increase with the cube of speed. An over speed of 10% will require 33% more output power. Roughly speaking, we can expect that the temperature rise will increase by about 75%. There is, nonetheless, a limit to what we can squeeze out of the induction at over speed. The maximum torque of the induction will drop as a function of 1/F in the field-weakening range. It is obvious that the induction will drop out if the frequency converter cannot support it with a voltage that corresponds to that needed by the torque. In many cases, the induction is run at maximum capacity from a sinusoidal power grid and any extra heating cannot be tolerated. If such an induction is powered from a frequency converter of some kind, it most probably must be run at lower output power in order to avoid overheating. It is not unusual that a frequency converter for big pumps above 300 kW will add extra induction losses of 25–30%. In the upper power range, only a few of the frequency converters have a high switching frequency: 500 to 1000 Hz is usual for the former generation of frequency converters. To compensate for the extra losses, it is necessary to reduce the output power. We recommends a general derating of 10–15% for large pumps. Since the frequency converter pollutes the supply grid with harmonics, an input filter sometimes is prescribed by the power company. This filter will decrease the available voltage by typically 5–10%. The induction will consequently run at 90–95% of nominal voltage. The consequence is additional heating. Derating might be necessary. Assume that the output power for the actual pump motor is 300 kW at 50 Hz and the temperature rise is 80°C using a sinusoidal power grid. Extra losses of 30% will result in an induction that is 30% warmer. A conservative assumption is that the temperature rise varies with the square of shaft power. The reduction can be achieved either by reducing impeller diameter or by speeding down. When the total efficiency of a frequency converter system is determined, the internal losses of the frequency converters must be included. 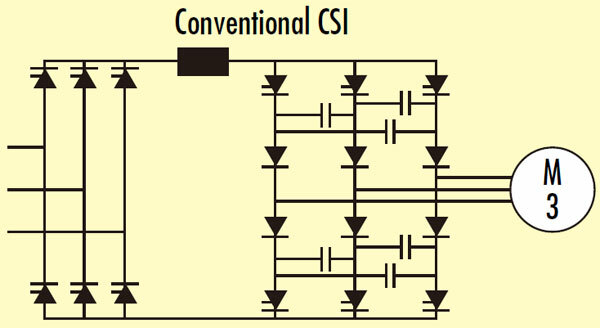 These frequency converter losses are not constant and not easy to determine. They consist of a constant part and a load dependent part. Cooling losses (cooling fan)—losses in the electronic circuits and so on. Switching losses and lead losses in the power semiconductors. Following figure shows the frequency converter efficiency as function of the frequency at a cubic load for units rated at 45, 90, and 260 kW. The curves are representative for frequency converters in the power range of 50–300 kW; with the switching frequency equaling about 3 kHz and with an IGBT of the second generation. The output voltages from modern frequency converters have a very short voltage rise time. dU/dT = 5000V/μs is a common value. Such steep voltage slopes will cause undue stress in the insulation materials of the induction winding. With short rise times, voltage in the stator winding is not uniformly distributed. With a sinusoidal power supply, the turn-turn voltage in an induction winding is normally equally distributed. With a frequency converter on the other hand, up to 80% of the voltage will drop across the first and the second turn. Since the insulation between the wires constitutes a weak point, this may prove to be hazardous for the induction. A short rise time also causes voltage reflection in the induction cable. In the worst case, this phenomena will double the voltage across the induction terminals. An induction fed from a 690-volt frequency converter might be exposed to up to 1 900 volts between phases. The voltage amplitude depends on the length of the induction cable and the rise time. With very short rise times, full reflection occurs in a cable 10 to 20 meters in length. To ensure function and ample motor life time, it is absolutely necessary that a winding be adapted for use with a frequency converter. Inductions for voltages above 500 volts must have some form of reinforced insulation. The stator winding must be impregnated with a resin that ensures an insulation free of bubbles or cavities. Glow discharges often start around cavities. This phenomena will eventually destroy the insulation. There are ways to protect a motor. Over and above a reinforced insulation system, it might be necessary to insert a filter between the frequency converter and the induction. Such filters are available from most well-known frequency converter suppliers. Breakdown of rotating machinery can often be related to bearing failure. In addition to excessive heating, insufficient lubrication or metal fatigue, electric current through the bearings may be the cause behind many mysterious bearing breakdowns, especially with large inductions. This phenomenon is generally caused by non-symmetry in the magnetic circuit, which induces a small voltage in the stator structure, or by a zero sequence current. If the potential between the stator structure and the shaft unit becomes high enough, a discharge will take place through the bearing. Small electric discharges between the rolling elements and the bearing raceway will eventually damage the bearing. The use of frequency converters will increase the probability of this type of bearing failure occurring. The switching technique of a modern frequency converter causes a zero-sequence current that, under certain circumstances, finds its way through the bearings. The easiest way to cure this problem is to raise an obstacle for the current. The usual method is to use a bearing with an insulating coating on the outer ring. Using of a frequency converter is not meaning problem-free. Lots of questions that must be paid attention during the design work. Will it be necessary, for example, to limit the available shaft power to prevent excessive heating? It may prove necessary to run at lower output power to avoid this issue. Will the induction motor insulation resist effects from the inverter? Is filtering necessary? Modern, efficient inverters have detrimental impact on the insulation due to high switching frequency and short voltage-rise time. Which maximum cable length can be used without producing full voltage reflection? The voltage amplitude depends on both the cable length and the rise time. With very short rise times, full reflection will occur in cables 10 to 20 meters long. Might it be necessary to use insulated bearings in order to prevent a zero-sequence current from finding its way to the bearings? Only when we clear of all these questions, we will be able to make right decisions about the use of a frequency converter.